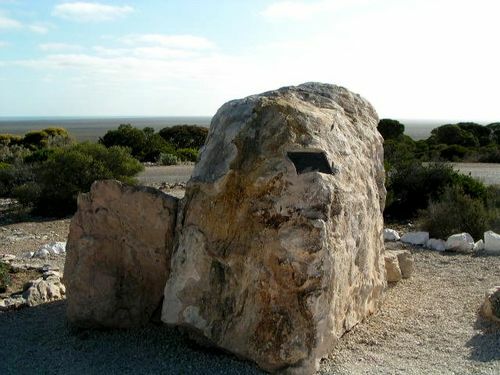 Monument commemorates the explorers Edward John Eyre, Baxter and Wylie who camped at Eucla in 1841 on their journey from Fowlers Bay to Albany. The memorial plaque was presented by the Post Office Historical Society of WA for the Sesquicentenary Celebration 1841 - 1991. On 11 March 1841 Camped In This Vicinity During The 1500km Journey From Fowlers Bay To Albany. Presented by the Post Office Historical Society of WA for the Sesquicentenary Celebration 1841 - 1991.